I need to address the mailchimp and stripe testing that form works. In order to test your MailChimp integration, you will first have to Integrate your form with MailChimp. After you have integrated it, you can make a submission on your form to see if all the data is forwarded correctly to the list that you had selected in your integration. When it comes to testing out your Stripe integration, you can try using the Test Mode after connecting to your existing Stripe account. 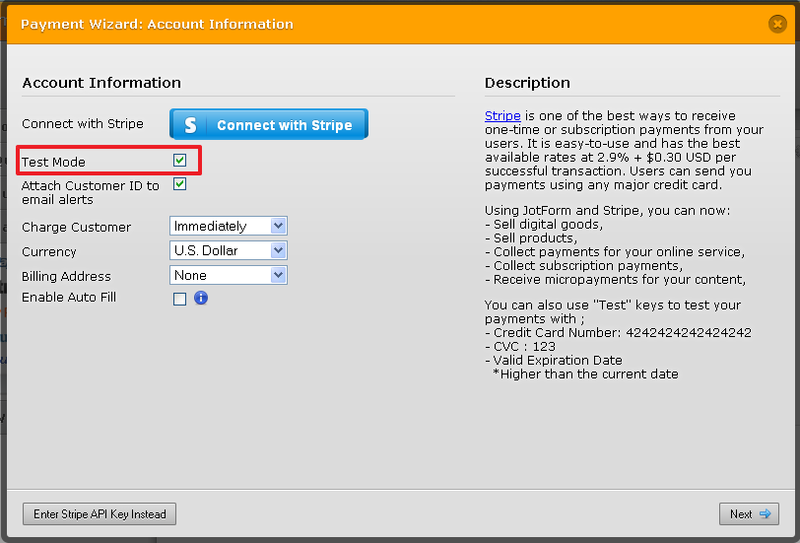 First click on the Connect with Stripe button to connect your Payment Tool with Stripe, and then check the Test Mode option. You should be able to test your Stripe integration this way.